These DS-4V stereo headsets come with a 6' replaceable cord that can withstand 250,000 flexes. The hypo-allergenic (no latex) replaceable ear cushions are a perfect fit for sensitive ears, and are easy to clean. Has a fully adjustable headstrap that adjusts to varying needs based on the user's preference. Experience exceptional sound quality with extra deep noise cancelling earcup cavities that lower ambient noises. Has a volume control located on the earcup. Features a noise-cancelling dynamic microphone that makes it easy to work with the voice recognition program. 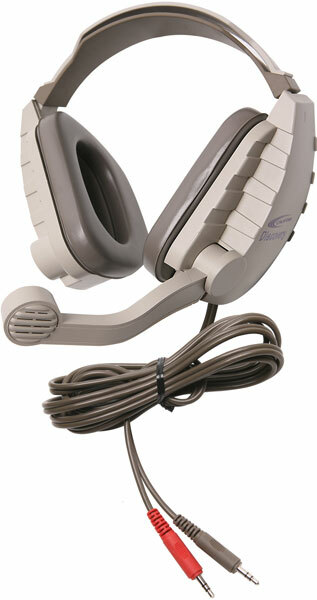 Compatible with CD/DVD players, TVs, tape players, and almost any computer, providing several uses for this headset. Replaceable, cleanable vinyl ear cushions extend the life of the headphone. Volume control on earcup for easy volume adjustments. Nickel plated 3.5mm plug ensures maximum signal transfer and reduces interference. Adjustable, flexible headband sling for comfort and fit.